The ASPB Ambassador Program was established in 2006 to involve students and postdocs in communicating ASPB’s mission to academic and industry communities and to the general public. ASPB ambassadors have since become some of the Society’s most active members. They engage their campus communities in outreach activities, represent ASPB at section conferences, and contribute articles to ASPB News. Most importantly, ASPB ambassadors have served the vital role of providing a voice for early-career members in the Society, often lending input on key issues. To further strengthen this program, the Membership Committee—with input from current ambassadors and other early-career members—felt that the Ambassador Program should be restructured to offer more leadership training and career development opportunities for this committed group of members. We are happy to announce that a proposal to enhance the Ambassador Program was approved by the ASPB Board of Directors for a one-year trial beginning in January 2019. The new program is designed to enhance the ambassador experience with leadership and science communication training activities and networking opportunities, all while maintaining the original purpose of engagement with other plant scientists to share ASPB’s mission. The Ambassador Program is open to members of ASPB who are students or postdocs or who work in industry. Ambassadors must complete at least two activities to encourage people to engage with ASPB or to communicate the importance of plant sciences. Alternatively, service on a standing ASPB committee or on the Ambassador Alliance (see below) will fulfill this contribution requirement. Ambassadors will have access to leadership training modules, networking opportunities, and other resources available on Plantae. To facilitate these aims, discounts on section and national meetings will be provided, and an annual Ambassador of the Year will be recognized. The Ambassador Program will now have its own governing body, the Ambassador Alliance, to oversee its main operations. The Ambassador Alliance will consist of a chair, vice chair, secretary, membership committee representative, and outgoing chair. These positions will be elected by the ambassadors. The Ambassador Program chair will also sit on the ASPB Council as a nonvoting representative. Current ambassadors will continue in the new program, and applications are now being accepted for additional ambassadors. Candidates must be a current ASPB member and complete the application available online by January 15, 2019 (applications open beginning of December). Applications will be reviewed, and new ambassadors selected, by the Ambassador Alliance together with the Membership Committee. Thanks to the entire Membership Committee and ASPB Member Services staff for developing this proposal. 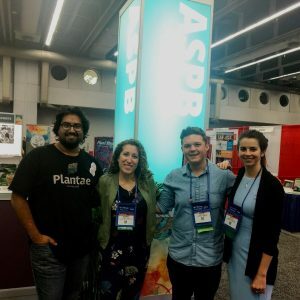 Left to right: ASPB ambassadors Rishi Masalia, Stephanie Klein, Nathan Harlan, and Kathryn McIntyre meeting up at Plant Biology 2018 in Montreal.